Last night we lead a book soiree hosted by Doree Clark of Stage Dor Dance Studio in Sausalito. The evening included not just a book signing or a reading, but a great discussion on how what you can do during to focus on your dreams given the restraints our economy has put on our lives. 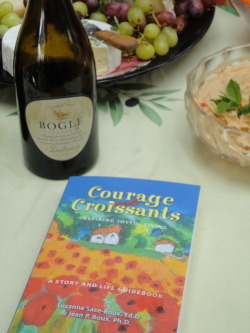 It was an intimate group of people sitting around a blue café table sipping red wine and nibbling on a few croissants, we discuss our book, Courage and Croissants, Inspiring Joyful Living and asked the question, “What dream are you wanting to create? The question provided an opportunity for everyone to share, laugh, cry, and come up with some great ideas. 1. Pick one thing you truly want to do and do it now. Jean recently decided he was not going to put off his dreams of having chickens and is hence raising two chickens in our backyard. We aren’t sure how long it will last as we aren’t quite set up to do so, but meanwhile he is like a little boy having such fun playing with his chickens. 2. Don’t make money your excuse. One woman stopped taking singing lessons because she could no longer afford them. The suggestion is create her own singing soiree in her house. Invite a friend or two who love to sing or are closet singers, make a great meal and once a month sing to their hearts delight. Keep on the path of your dreams. Put one step in front of the other. Every little movement towards living your dreams is one step closer to achieving them. Let us know how you are doing on your dreams!